A tiny hive for your home. Bee Buddy was designed with our apitherapy customers in mind- it provides a very natural habitat for your bees, maximizing their lifespan. Bee Buddy is hand-crafted product, essentially servings as a mini-hive that can be kept both indoors and out. Each box has a plastic honeycomb back that is beeswax coated. Inside, there is an artificial queen that makes the bees think they are ‘queen right’ which keeps them content and easy to handle. Bee Buddy has a feeder that provides a constant food source. The feeder hole is screened so bees don’t get loose when the feeder is removed for filling. To feed the bees, simply keep the feeder full of honey; you can expect to refill it every week or two. Bee Buddy allows you to let your bees out for a potty break which allows them to smell better and live longer. Bees will not defecate where they live. Just think you would feel if you had to hold it for a week or two! Bee Buddy should be placed outside with a source of shade; simply leave the door open so they can come and go as they please. Bee Buddy is small enough to put in your refrigerator to slow the bees down during stinging sessions. Bee Buddy pays for itself quickly by saving shipping charges. Summer is the hardest time for us to ship bees. 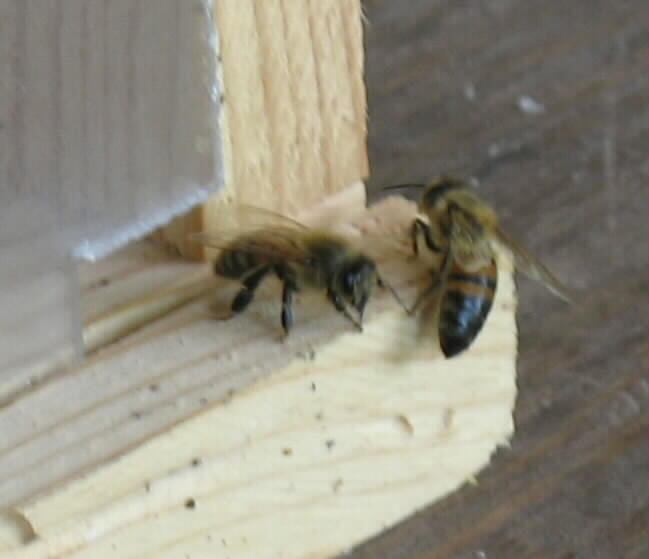 By having two or three boxes shipped at the same time, you will be able to have plenty of extra bees on hand. Check out our video clips on how to put bees in Bee Buddy. Please click on the buttons below for additional Bee Buddy information.